Are you, or is someone you know, a member of St Mary’s congregation but, owing to illness or infirmity, no longer able to attend church services to receive Holy Communion (Eucharist)? If so, it’s now possible for you to receive Holy Communion at home, given by specially trained and licensed 'Eucharistic Lay Ministers'. Why is this now possible? 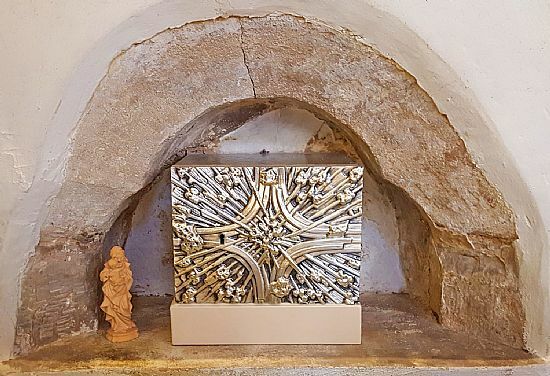 The church can now store consecrated elements of bread and wine (the sacrament) in an aumbry (a locked safe used specifically for this purpose, see right). Thus at a church Eucharist service the presiding minister can bless extra bread and wine which is then stored safely in the aumbry ready for use in the community by Eucharistic Lay Ministers. 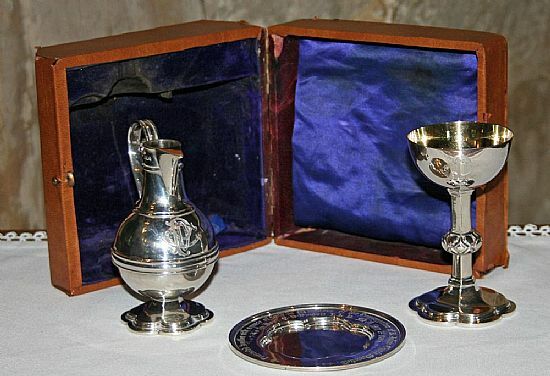 The Lay Ministers transport the sacrament and vessels used in Holy Communion to your home in a special portable communion set (see left) which contains everything that is needed for the service. Who can receive Home Communion? Members of the congregation who were entitled to receive communion in the past (communicants) but have since become unable to attend the church in person, either permanently or temporarily (perhaps due to illness) are entitled to receive Home Communion. The service typically lasts about half an hour. How do I arrange for an initial Home Communion visit? The easiest way is to email: homecommunion@plumtree.church and include your name and phone number in the body of the email; a Eucharistic Lay Minister will then phone you back to arrange an initial visit at a time and date that's convenient to you. Alternatively you can conatct Tony Darby. If you'd prefer, you can nominate someone to make contact on your behalf. How often can I receive Home Communion? You should discuss this with the Eucharistic Lay Minister at your first visit; but it is intended that your Home Communion visits will become a regular event.